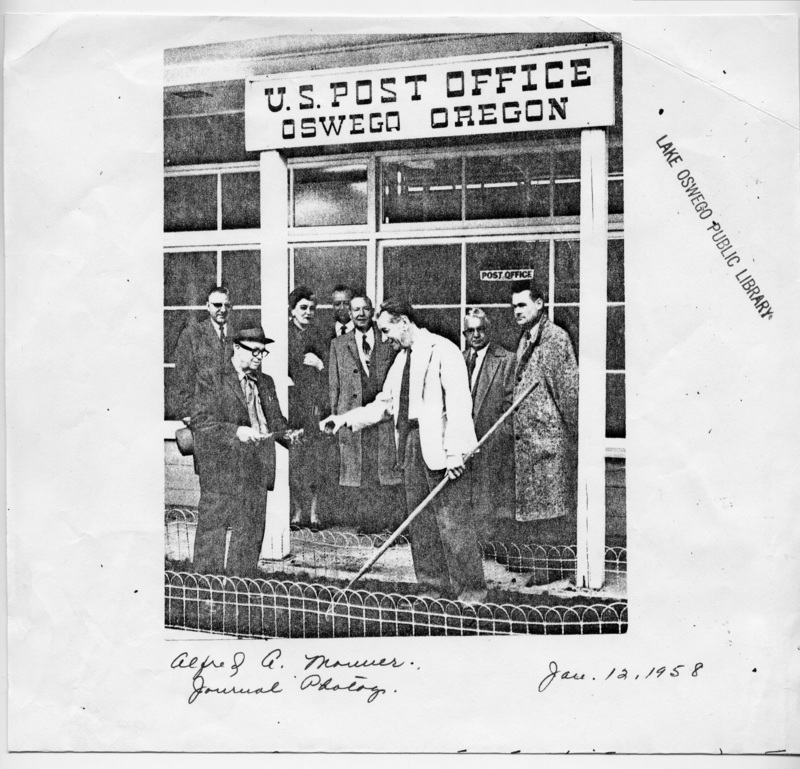 George Carl, Oswego postmaster (with rake) gets advice from George Smith [?] (with trowel). on proper method for planting lily bulbs. Bloom was recently developed as community's official flower. Civic leaders, officials watching event included (left to right) James Wizer, Mrs. Helen Millette, Alan Willis, Jr. Virgil MacMickle, George Rogers and Oswego Mayor Lee Stidd, Jr. Please credit Alfred A. Monner and the Oregon Historical Society. Description Photocopy of a photograph. Notes on front: Alfred A. Monner. Journal Photog. Jan. 12, 1958. there is a very similar photo in the Oswego Review Jan. 9, 1958, p.1. Transcription George Carl, Oswego postmaster (with rake) gets advice from George Smith [?] (with trowel). on proper method for planting lily bulbs. Bloom was recently developed as community's official flower. Civic leaders, officials watching event included (left to right) James Wizer, Mrs. Helen Millette, Alan Willis, Jr. Virgil MacMickle, George Rogers and Oswego Mayor Lee Stidd, Jr. Please credit Alfred A. Monner and the Oregon Historical Society.